A chapel, dedicated to St. Anne. mother of the Blessed Virgin Mary and the patron Saint of Seafarers, once stood beside a road which ran north/south from Bideford to Appledore, across the river and continued to Saunton, cutting the present road, and continuing past Saunton Court to Georgeham and llfracombc. The Chapel stood on a spot just after the river had been crossed and was one of the ancient chapels situated within the parish of Braunton. Unfortunately the sand and the hand of man have removed all signs of this original building, but for a stone basin, which stands in the porch of the present chapel and is reputed to be the font. 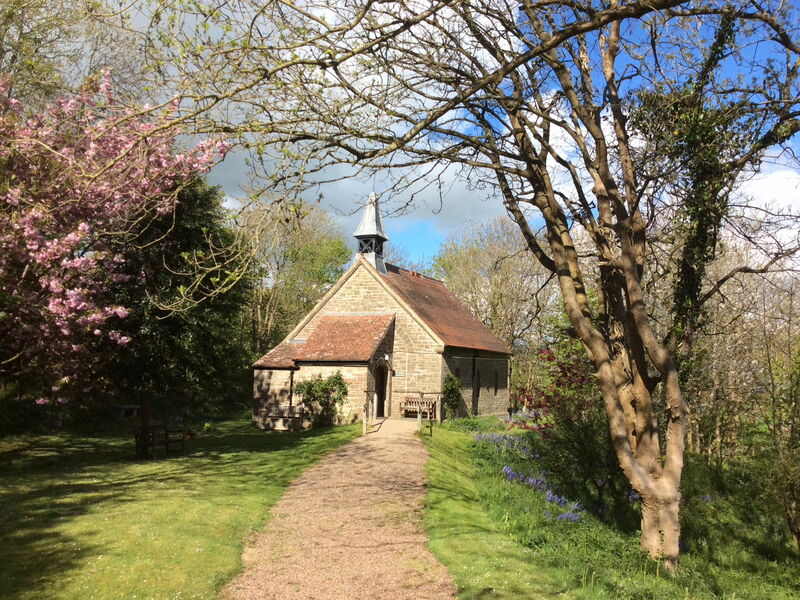 The present church dedicated also to St. Anne, is a small delightful chapel-of-ease set amid bracken and trees beside the main road which links Saunton with Braunton. It was built with money provided by the Mortiock-Brown family of Lobb, the land being donated by the Christie family of Glynebourne, Lewes. Miss Mildred Mortlock-Brown laid the foundation stone in September, 1895, the opening service was held on 29th April, 1896. The three lights which make up the east window depict St. Anne, St. Agnes and St. John. The centre light shows St. Anne. The face used for portraying St. Anne is that of Miss Mortlock-Brown’s mother. About her are ﬂying doves with rings in their beaks, her emblem, ad behind her is the sea. She stands on the sand hills, with viper’s bugloss growing at her feet, she hold a ship, and below against a background of the sea and ﬁshing boats, is a picture of the original chapel of St. Anne. The left light shows St. Agnes. With her sword of martyrdom, St. Agnes wears a robe embroidered with lilies and stands in a meadow in the midst of tulips, fritillaries, daisies and columbines. The right light shows St. John. We see him in the isle of Patnos, writing the Apocalypse the emblematic eagle is beside him and in the far distance is the vision if the Holy City. In the past 115 years St. Anne’s has been loved and cherished by all those who have worshipped here. 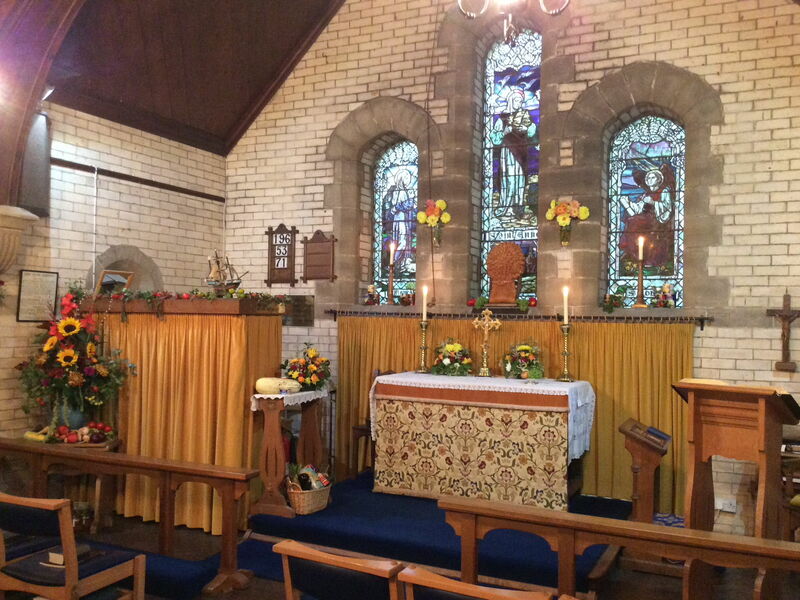 If you have never visited our beautiful little church, I urge you to do so. it is set in amongst the trees, has panoramic views across the burrows to the sea and is a most wonderful little haven to sit, listen to the birds, relax and talk with God. We thank Him for this place and pray that we and future generations continue His work here for many more years to come.